As someone who learned English later on in life, I was taught that different from is the correct grammar to use: this is different from that. However, it seems these days everyone uses different than instead. I know it's incorrect usage, but does the language evolve if the majority wins? Edit: Some commented different than is American English and different from is British English, both are OK. IMO, this isn't like color versus colour, though. Than is used after a comparative adjective, e.g. taller than, whiter than. The word different isn't a comparative adjective, unless used in more different than. Logically, it makes no sense to say different than. You left out the construction that makes the question more interesting: different to. The quick answer is that "different from" is always correct and acceptable everywhere, but "different than" is common in US usage (as odd as it may seem for two things to be both different than the other), and "different to" is common in UK usage (as odd as it may seem to have both "different from" and "different to" mean the same thing). "Different from" is the construction that no one will object to. "Different to" is fairly common informally in the U.K., but rare in the U.S. "Different than" is sometimes used to avoid the cumbersome "different from that which", etc. (e.g., "a very different Pamela than I used to leave all company and pleasure for" -- Samuel Richardson). Some U.S. speakers use "different than" exclusively. Some people have insisted on "different from" on the grounds that "from" is required after "to differ". But Fowler points out that there are many other adjectives that do not conform to the construction of their parent verbs (e.g., "accords with", but "according to"; "derogates from", but "derogatory to"). So it's safest to avoid both "different to" and "different than", even though they have ≈30% popularity in UK and US speech respectively, and use "different from" exclusively. See also Michael Quinion's World Wide Words where he points out that many good writers have used the much-maligned now-grudgingly-accepted "than". If you look in the Corpus of Contemporary American English (COCA), you will find that different than, despite objections to its being “illogical” and “incorrect”, is in fact a very common and therefore standard usage in American English. From this we can see that, indeed, different from is more common than different than, but by a ratio of less than 4 to 1, meaning that different than enjoys substantial minority usage. Further dividing up the usage, we see that different than is almost as common as different from in spoken English (22.61 incidences per million words for different from versus 19.81 for different than), but much less common in written forms. When a usage is more common in spoken English, that is usually a sign that it is less formal. Here we see that different than is a relatively new development in American English, only coming into any significant usage starting in the 1960s. It is probably this relative newness that makes usage commenters object to different than. 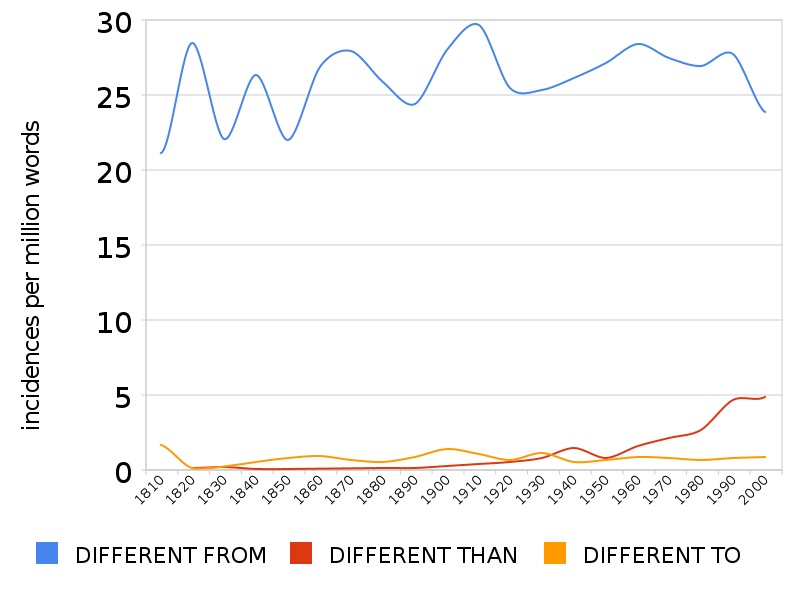 But the rise of different than is probably inexorable, and the COCA data, which divides up incidences over the last 4 half-decades, shows that the ratio in favor of different from was 4.4 to 1 for 1990–1994, but had dropped to 2.9 to 1 by 2005–2010. So, in conclusion, yes different from is more common than different than, and different than is less formal than different from, probably because it is a relatively recent development. However, different than occurs with significant frequency even in formal academic writing, so to write it off as simply “incorrect” is to ignore the facts. If current trends continue, different than and different from will be equally common within a few decades. "to differ than" makes no sense. Therefore, if you cannot differ than something, you also cannot be different than something. It's completely not like "greater than". Different. That different can only be followed by from & not by to is a superstition. Not only is to ‘found in writers of all ages’ (OED); the principle on which it is rejected (You do not say differ to; therefore you cannot say different to) involves a hasty & ill-defined generalization. Is it all derivatives, or derivative adjectives, or adjectives that were once participles, or actual participles, that must conform to the construction of their parent verbs? It is true of the last only; we cannot say differing to; but that leaves different out in the cold. If it is all derivatives, why do we say according, agreeable & pursuant, to instructions, when we have to say this accords with, agrees with, or pursues instructions? If derivative adjectives, why derogatory to, inconceivable to, in contrast with derogates from, not to be conceived by? If ex-participle adjectives, why do pleases, suffices, defies, me go each its own way and yield pleasant to, sufficient for, and defiant of, me? The fact is that the objections to different to, like those to averse to, sympathy for & compare to are mere pedantries. This does not imply that different from is wrong; on the contrary, it is ‘now usual’ (OED); but it is only so owing to the dead set made against different to by mistaken critics. The majority always wins, and there's always a minority that sticks to traditional correctness, and eventually disappears. The very meanings of some words in the English language (as in others) have changed so dramatically in some cases that historical speakers would never be likely to guess. There are too many to begin to list, though perhaps someone can provide a few nice examples off the top of their head. Different from is the construction most often used in the U.S. and Britain; different than (used almost exclusively in North America) is also used, especially in speech. I am an American living in Australia, and I'm not sure anymore what I pull from American English, and what I pull from Australian English, but I use "different from" unless I'm using more/less, as in "more different than". Not the answer you're looking for? Browse other questions tagged word-choice grammaticality differences prepositions transatlantic-differences or ask your own question. Shall I put the adjective behind the noun in this case? Is using “as from” correct English? Which is the correct construct? Which is the correct preposition: at or from? Which one is correct: “after a century of” or “after a century from”? “From all different” or “from all the different” …?